It’s a beautiful book; small and delicate and it is okay to be taken in by its external beauty, in this case one has nothing to worry about. Peirene Press produce a different series of books each year, specialising in contemporary European novellas which have been translated, each book has to be under 200 pages long, perfect for a one sitting read. Once the reader has pealed the cover away, they are immediately transported into a world with a very lucid Danish backdrop where we enter the lives of Bess and Halland. From the stillness of their house where they are safe and getting on with their lives, it takes an instant for everything to be torn apart and that is the sudden murder of Halland. This murder mystery has many of the essential detective fiction ingredients; we have the small quaint town where neighbours know one another and easily involve themselves in your life, lulling you into an almost Miss Marple sense of security, but it is nothing like that. In fact, this is a rather different type of crime novel; it is one with a beating heart. Halland’s death invites the reader into the inner workings of a relationship and the intimacy of this is cutting and confining and therefore makes the reader feel as though they are spying. 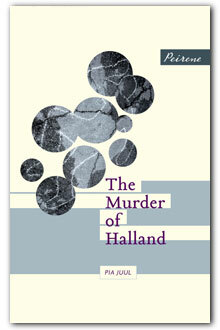 At times, it is as if Halland’s sudden murder has been placed rather firmly in the background as the story begins to focus on Bess’s loss; the raw emotion of Halland’s death and the piecing together of the puzzle that a couple’s life can in fact be. Bess soon discovers that their life together what not as it seemed. This theme of seeing without recognition is prevalent throughout the novella; there are many instances when Bess looks at herself in the mirror and does not recognize the person looking back at her and it is certain that nothing is really as it seems. But the haunting quality of this dark story is in the act of learning things about someone after their death as well as finding out who you really are without them. Bess’s reactions to Halland’s death can be easily misinterpreted; at times she appears unaffected by the death of her partner of ten year’s, but what is the right way to grieve? It becomes more evident over time she is in the shadow world of shock and disbelief as she slowly pieces shattering flakes of their life together. The Murder of Halland is a read that is sure to hook you in and glued to the reading spot, where you are unwilling to move from. Not only is this novella superbly written, it is also steeped in a penetrating atmosphere which has an eerie way of swallowing one whole, making you forget the world outside of it. The Peirene Press collection is one that you are sure to go back to, you never know what other little gems are waiting to be found.